Great weather here in South Texas and hopefully friends in the North will soon have beautiful Spring weather and no more snow until next Winter! I really do not have anything to show, BUT alas, I finally decided that I really needed to have a fabric washing week-end. Now that doesn’t seem like a lot of work, but I had an overload of fabric that had been sitting in a chair for about 5 months which is way to long. Now anything over a yard is easy to wash, trim threads, and fold unless ironing is required. (I always figure that I would have to press it when I use it in a quilt). I cannot say that about fat quarters! What a mess! I like to purchase them from Whittle’s when they have them on sale, or purchase the brown bag of mixed reproduction fabrics. 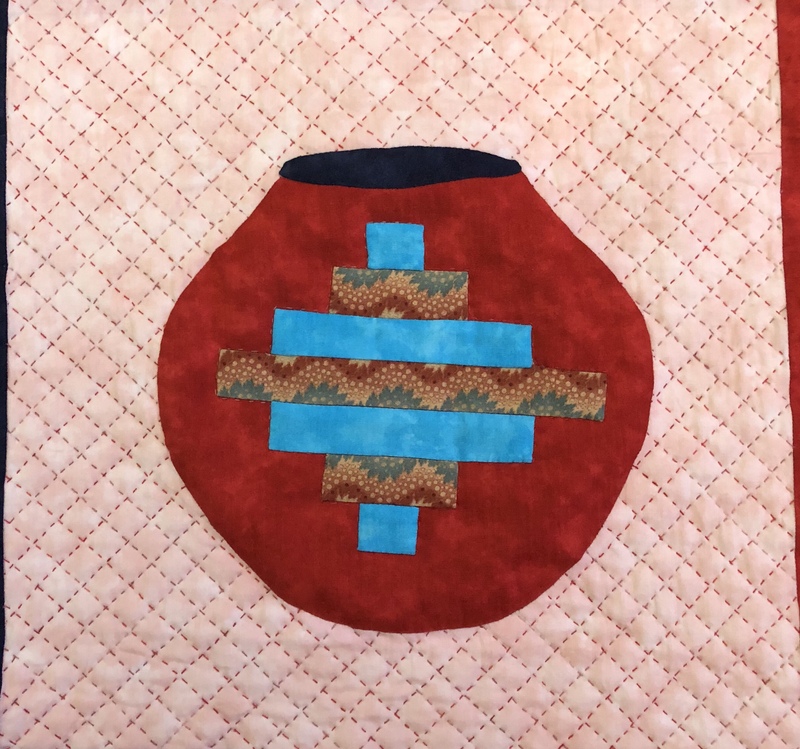 I would like to make a black and red quilt and had been building a stash. Black reproduction fabrics are hard to find sometimes. Here is the stack of fabric I washed, trimmed, and ironed. These are the ‘over’ 1 yard pieces. 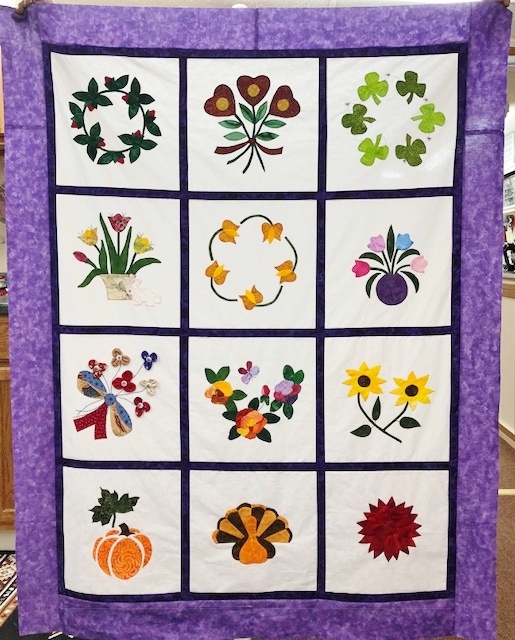 Mostly purchased for Reproduction quilts like Di Ford’s. Found them on sale on line and just could not pass them up! Then it was time to wash a group of fat quarters. These were purchased from Whittle’s and I was surprised to find that I have a great selection of the Garibaldi line in Red and Blacks! I have plenty to make a quilt now in reds and blacks! Next are a group of P&B ‘Mesh’ fabric line and boy do I know which quilt these will be used in!!!! Absolutely beautiful! I see some stars in my future with this fabric!!! 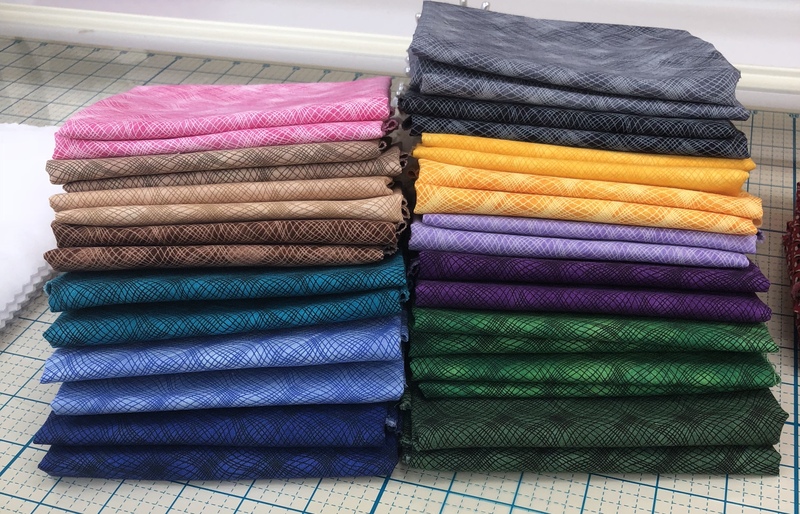 In fact, I ordered 2 more fat quarter bundles of the fabric. P&B is one of the fabric companies that I love. Can always depend on getting great fabric from them. 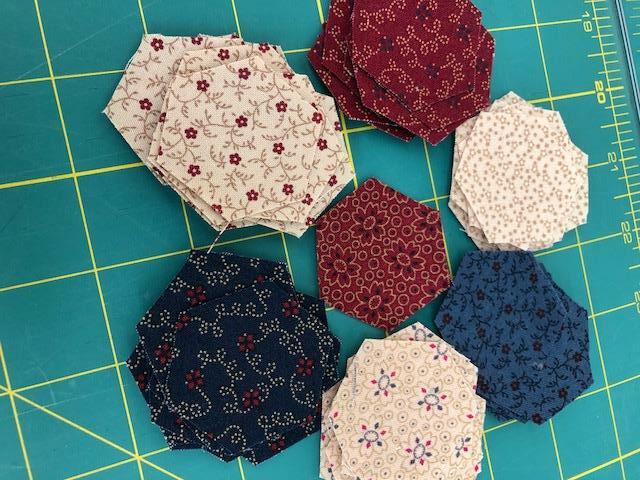 These were the remaining fat quarters from group that I ordered. I was a 2 day effort to get all of the washing and ironing completed, so today I finished up the remaining FQ’s and have taken it easy. Doing some hand work! 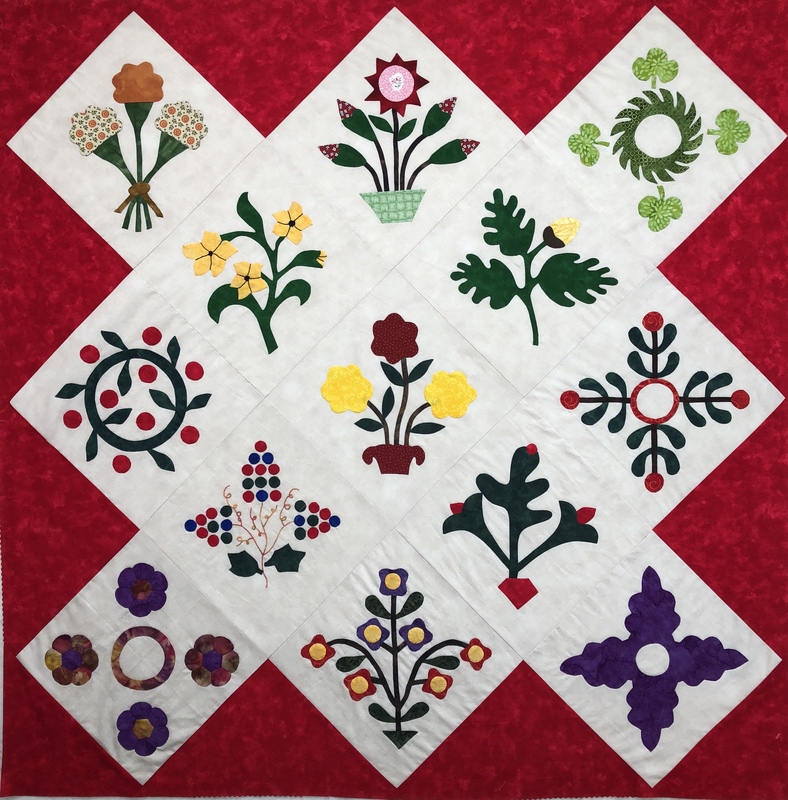 I am working on Block 4 of Nesting, borders for Mountmellick and still hoping to get to some hand quilting on Indian Summer. I think I have a bad case of Spring Fever, just wanting to not get in a hurry about anything! Have a wonderful week! Enjoy stitching! 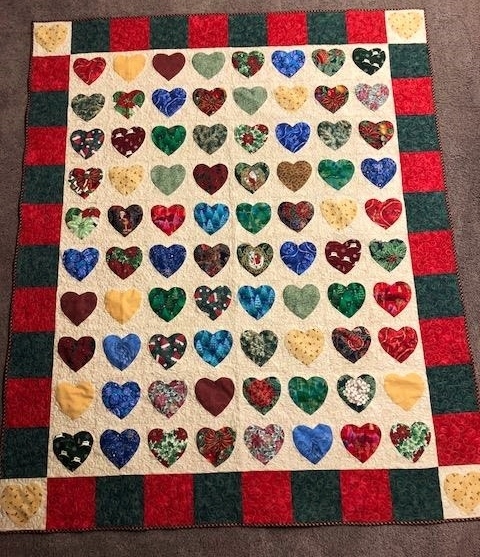 After completing my I Love Texas Quilt I do believe I suffered from quilt burnout! I only worked a little on my Indian Summer so nothing to show on that one. Then I decided to work on the 4th Block for Nesting. I finished one of the long stems and the next evening when I was ready to work on leaves I could not find the sandwich bag with the pieces for applique! What a hoot that was. I had the feeling that they were close at hand and finally after a couple of days I found the little baggie inside the recliner! So maybe this week I will make more progress on that block. I then started work on the next border for Mountmellick. 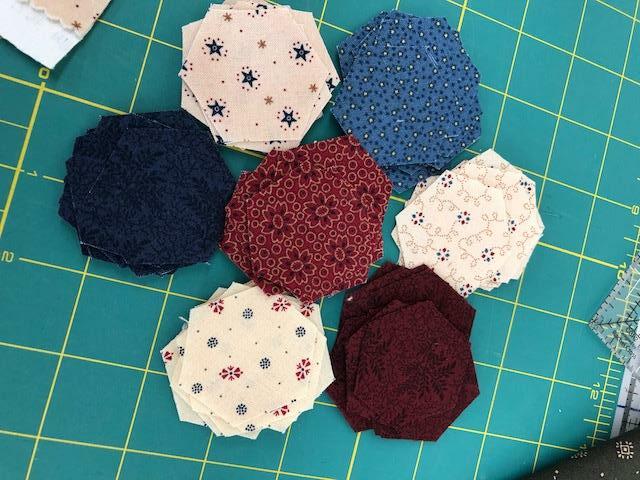 I did accomplish cutting out 4 border sides, marking them for the stems, and cutting out the hexagons (1/2″ hexies) for the border. This had to be very precise because of the placement of the stems and flowers AND the exact length to prevent problems when sewing it to the center! Di Ford used a lot of Broderie Perse (French for “Persian embroidery”) on this border, but I have decided to make 28 hexagon flowers (small babies) and forgo the BP. I have appliqued the stem on one of the 4 borders. I believe I cut out 168 hexagons. I have the template and PP from Paper Pieces which makes it a much faster way to cut them. Status on catching up on quilting 5 flimsy’s. 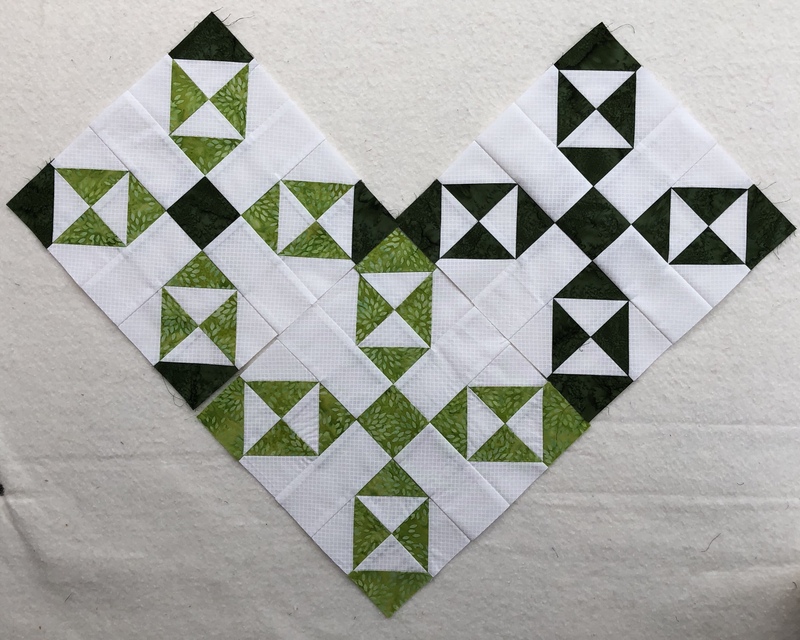 I think THINK I have found a long arm quilter to quilt 5 of my quilts with pantograms – that takes a lot off of me and only leaves me with the quilts to be hand quilted! Will check this out next week, so that eliminates some more work to catch up on. I also dabble with knitting I am not near the knitter that Kathy Reeves is and others who Blog, but hope someday to become more proficient. 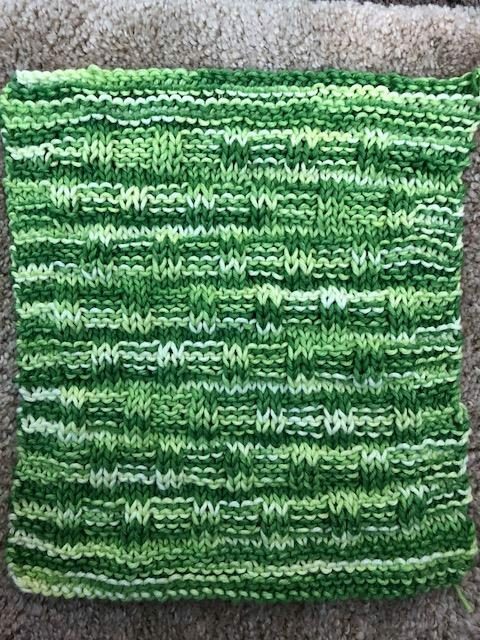 I have been trying to make a dish rag with a basketweave pattern for the last year or so (see I do not do a lot of knitting) and failed. This time I went to a local (100 mile round trip) yarn shop and had about 30 minutes of assistance and came home and made the darn thing. This time I used a cotton thread – variegated – but it came out perfect. 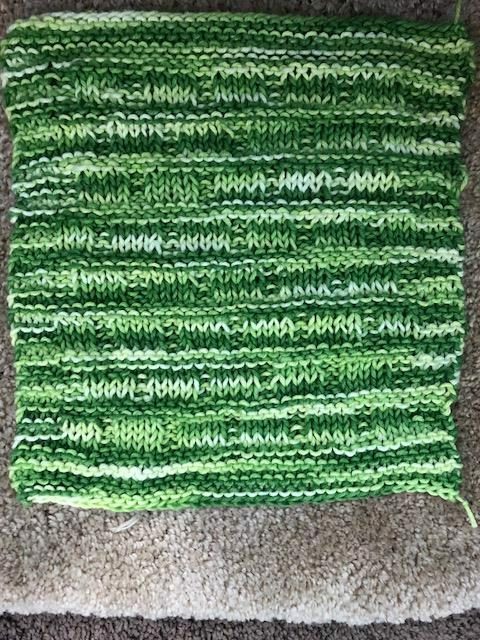 Now I am proud of this and will continue to practice my knitting with them and then move on to something better! Yesterday I decided it was time to “wash fabric” time! I have some more fat quarters to wash and press, but have made a lot of progress on that goal also! I have another week (9 days to be precise) to become more productive in meeting my monthly goals for April – Yup April is almost history for 2018! Sometimes when I push too hard and other issues are in the mix, I have to step back and get away from anything I just have to do and veg! It worked this time because I woke up today ready to get with the program and catch up on projects. What a week – for a few days things did not go well, but starting Wednesday I was on a roll! I am so happy because here are my finishes for the week. I have completed finishing the quilt UFO’s that were waiting to become a flimsy!!!! I finished putting the final border on my I Love Texas quilt. I changed the setting from the original pattern, but used the embroidery patterns for the block. I found the Medallion Panel a couple of years ago and really had to work to make it all come together! 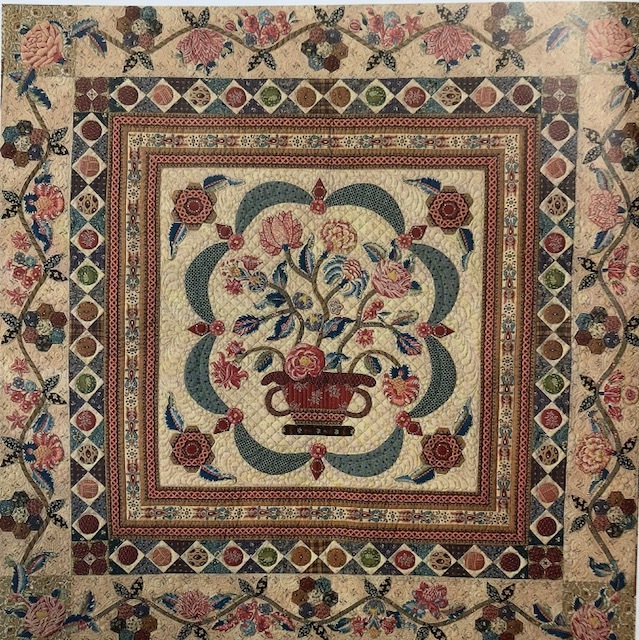 This is the original pattern. This is my Version and because I did not use any Stars, I named mine the I Love Texas quilt! 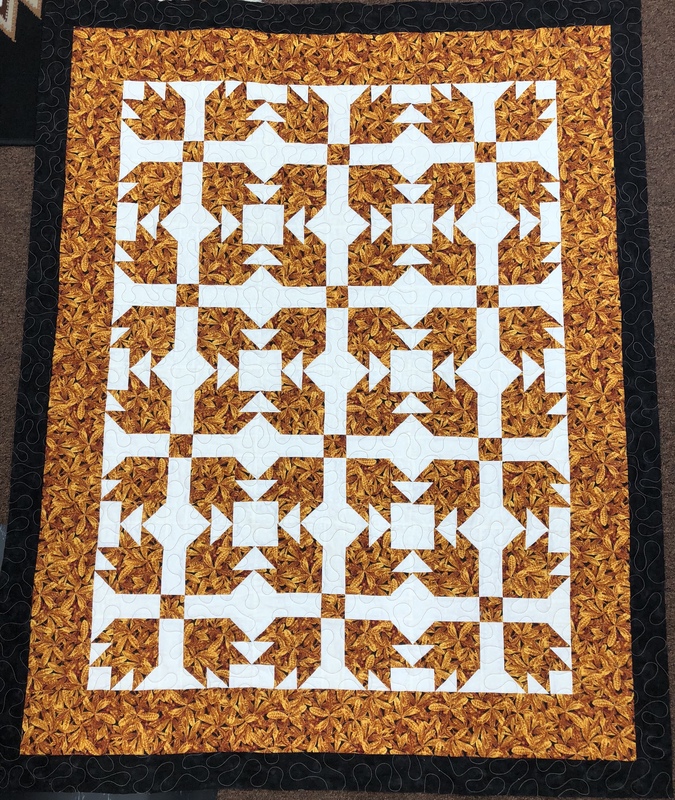 The brown border is the same all the way around the quilt, just could not get a good picture! 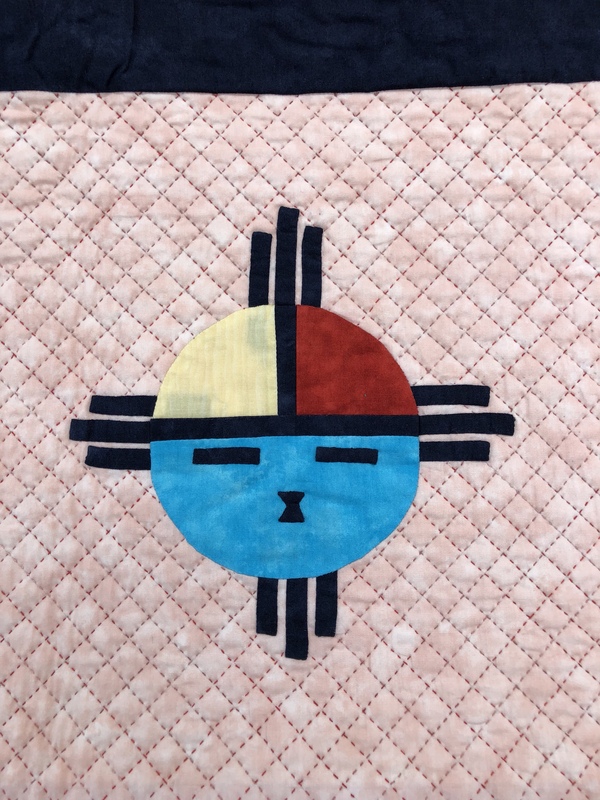 Today after getting the border on my Texas quilt, I decided to make a small wall hanging out of a block from A Bountiful Life that I made about 3 years ago and it is not part of the quilt that is in the UFO stack for applique. This was an unplanned UFO for April, but it is now marked, sandwiched and ready for hand quilting! Next, I did the beak and eyes on Block 3 of Nesting – only 1 more block and the borders and it will become a flimsy! AND then I cut out my 3 blocks for RSC 2018 Squared Away! I was able to finish 1 block and the remaining 2 are the same color and ready to be sewn together! All in all, I am thrilled. 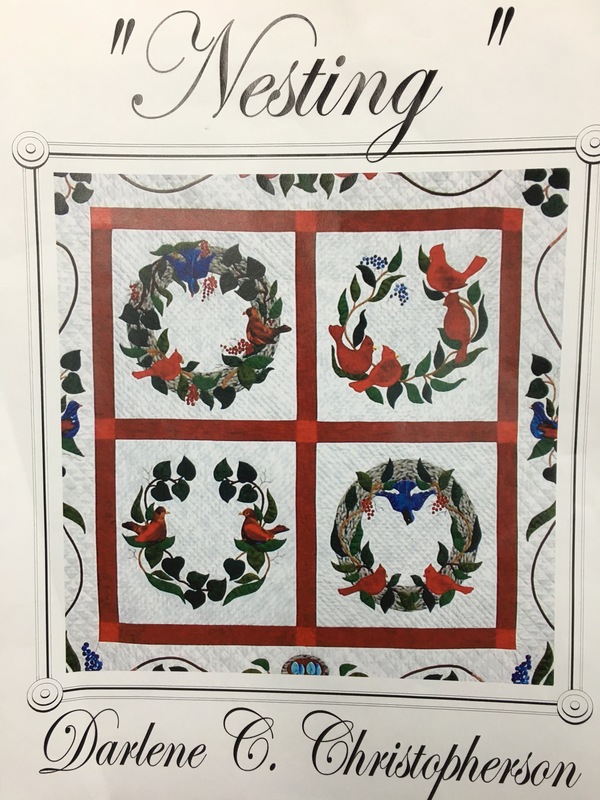 I will be working on quilting Happy Scrappy, Nesting, Indian Summer, Britton Hall and Mountmellick. Giving all a little time and they will be completed! Have a great week-end. It feels so good to slowly achieve my goals!!!! Even with all the Caremark acid maker, I am making progress and this makes me happy!